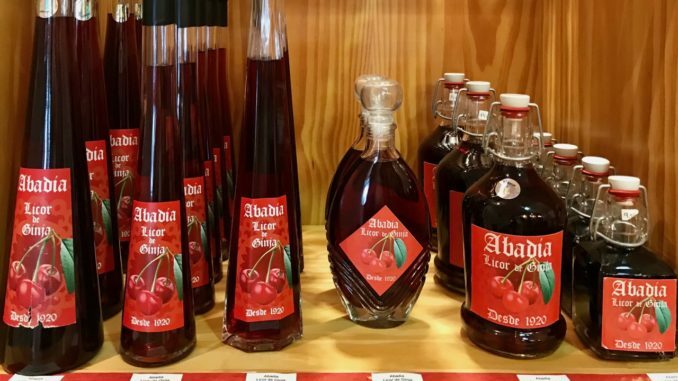 Ginja (or “Ginginha”) is a famous Portuguese cherry liqueur. Sour cherries are added to brandy to soak. Sugar is added and sometimes other things for additional flavour (e.g. cinnamon, cloves). While the recipe is pretty simple, the taste varied quite a bit based on individual secret recipes. We had Ginja for the first time when we were in Lisbon. 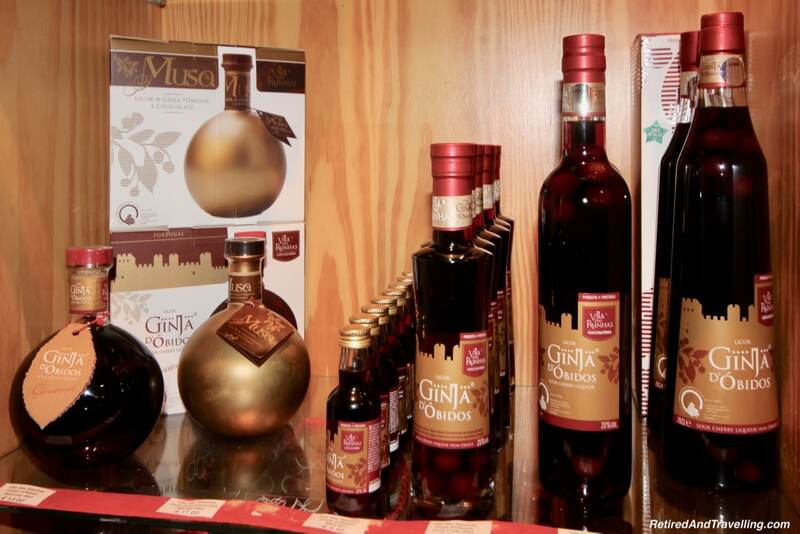 Decanters of Ginja were available when we stayed at the Intercontinental Lisbon. 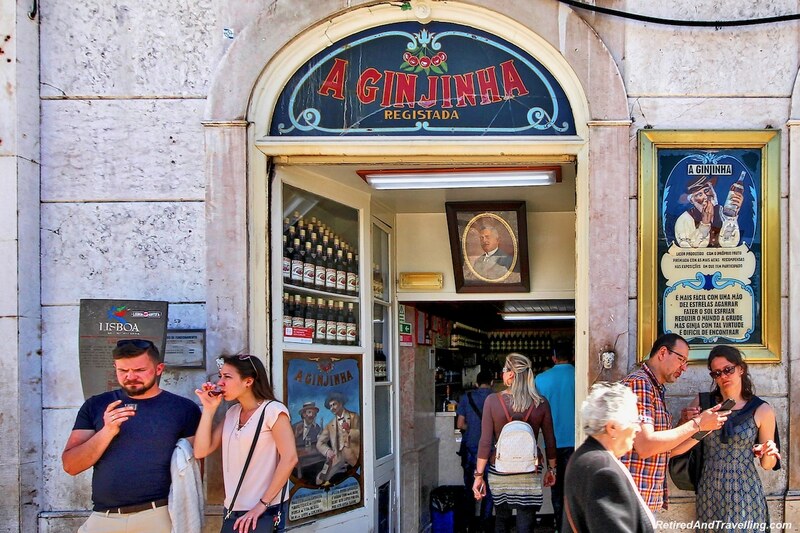 When we walked the streets of Lisbon, we found Ginja stores. 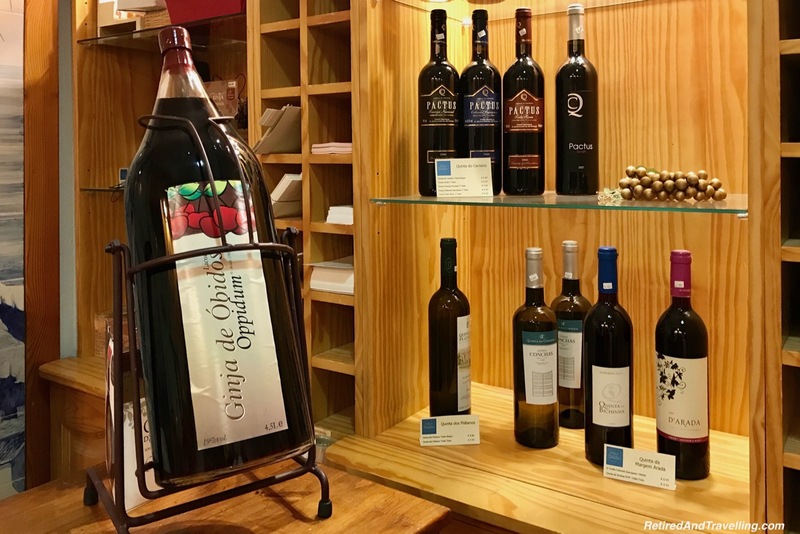 The bottles they sold said it was Ginja from Obidos. But everyone told us we needed to have Ginja in Obidos. 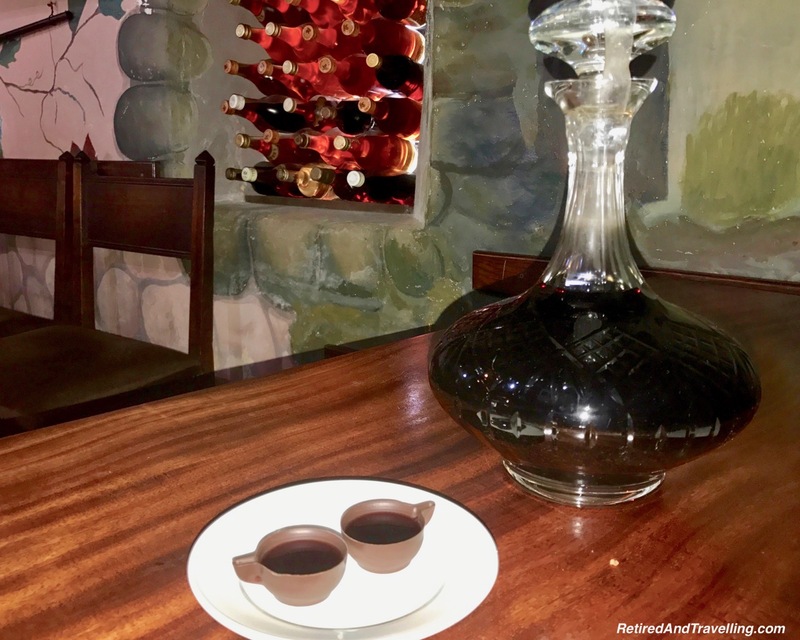 It was served in Obidos in chocolate cups! 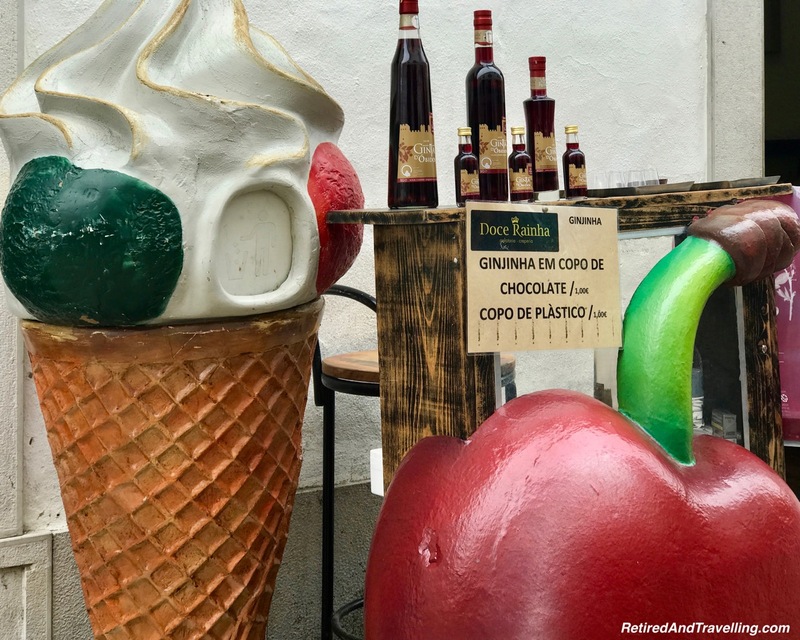 David would not miss trying Ginja when we stayed in the walled city of Obidos. 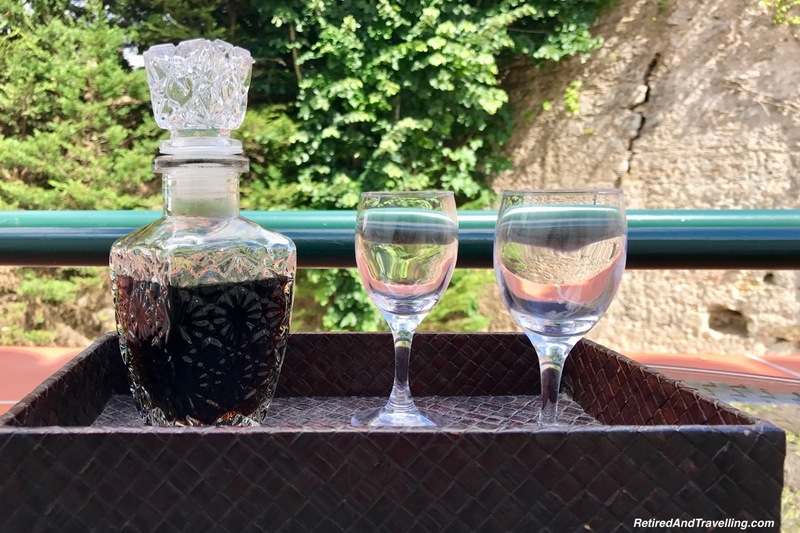 When we checked into our hotel for our stay in Obidos, there was a decanter of Ginja waiting in our room. It was re-filled every night. 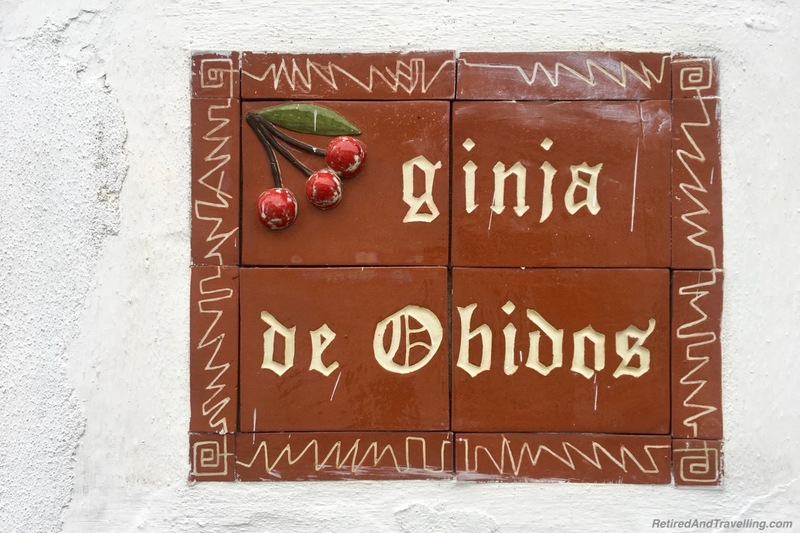 We would not have to go far for Ginja in Obidos. 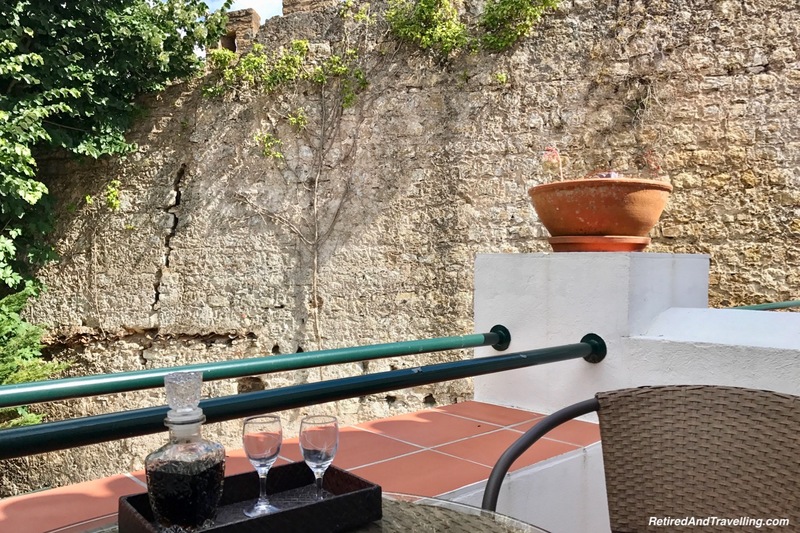 It was a perfect treat on the patio looking at the city walls. 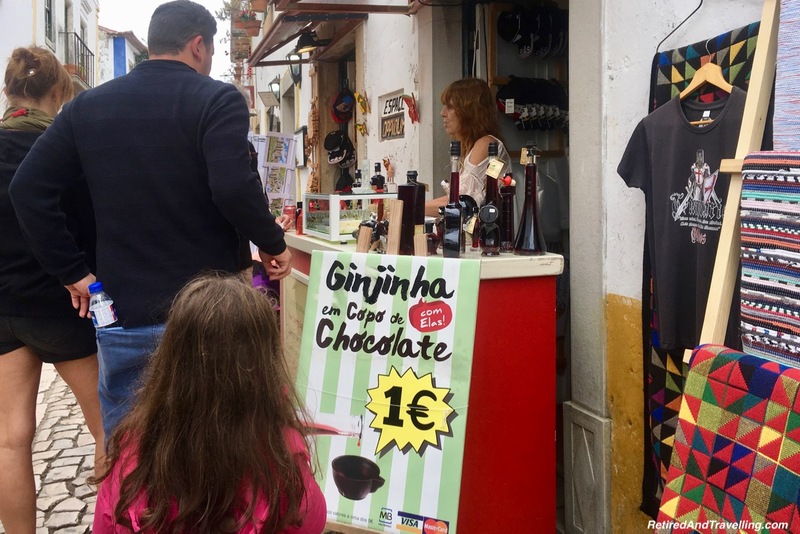 As we wandered the streets of Obidos there was Ginja everywhere. We could have it straight or in dark chocolate cups. 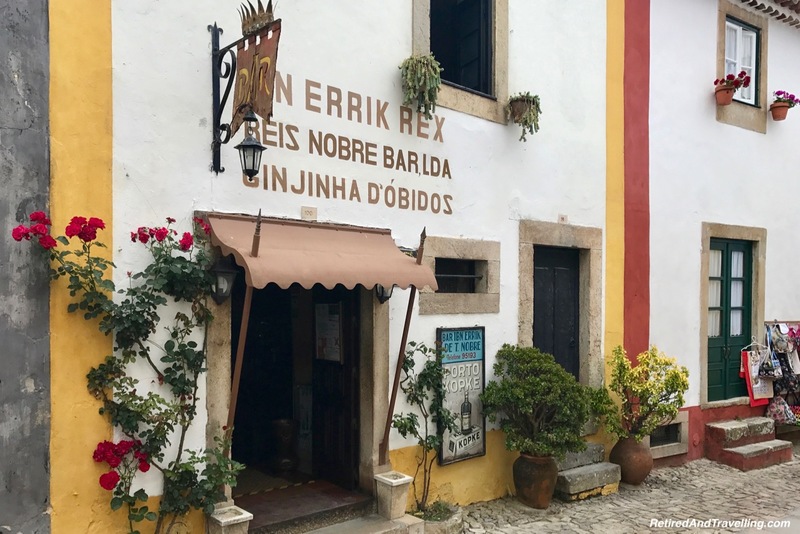 Our hotel directed us to the Bar IBN Errik Rex for the “best” Ginja in Obidos. We started our tasting like tourists with chocolate cups. 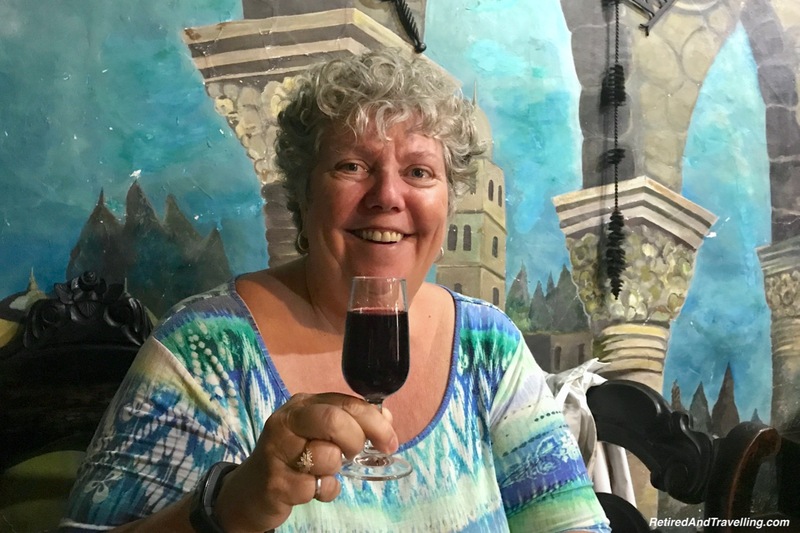 The Ginja was very good – less syrupy and sweet than others we tried. But we were encouraged to try the Ginja without the chocolate cup. So we did! And it did taste a little different without the chocolate. 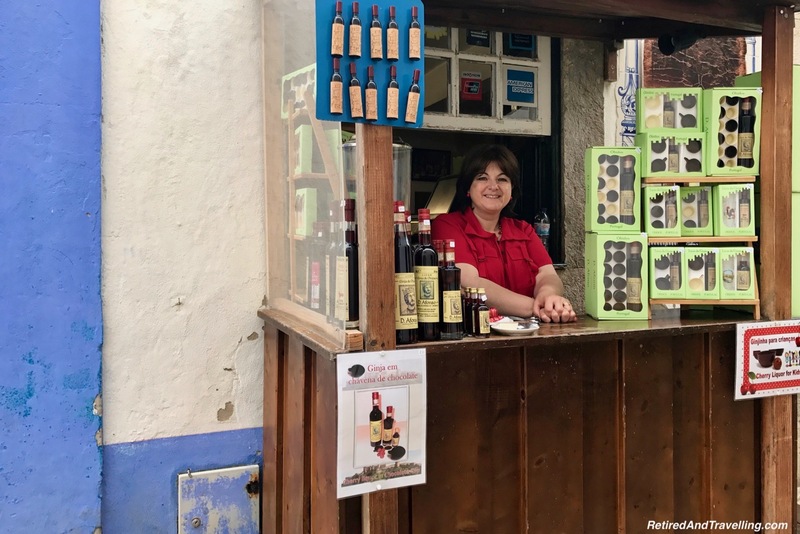 We had an interesting discussion with the proprietor that wandered into the history of Portugal. As we got ready to leave, David was told he had to sit in the corner booth. He was directed to lift a flap of wallpaper that revealed a naked woman underneath. It had been there for over 50 years as a curiosity in the town. 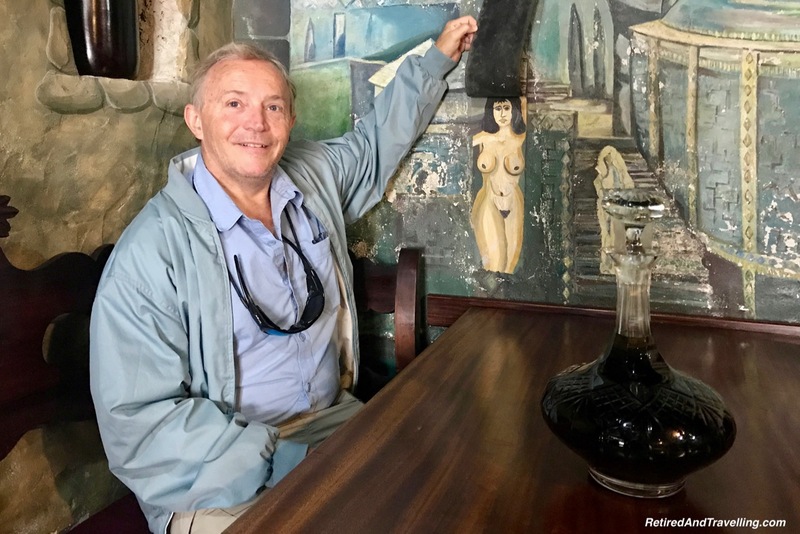 Apparently Rick Steves had sat in the booth and the naked woman was edited out of his travel videos. I was glad we waited for Ginja on our visit to Obidos. The ceremony added to the allure of this treat. Try it in a dark chocolate cup. 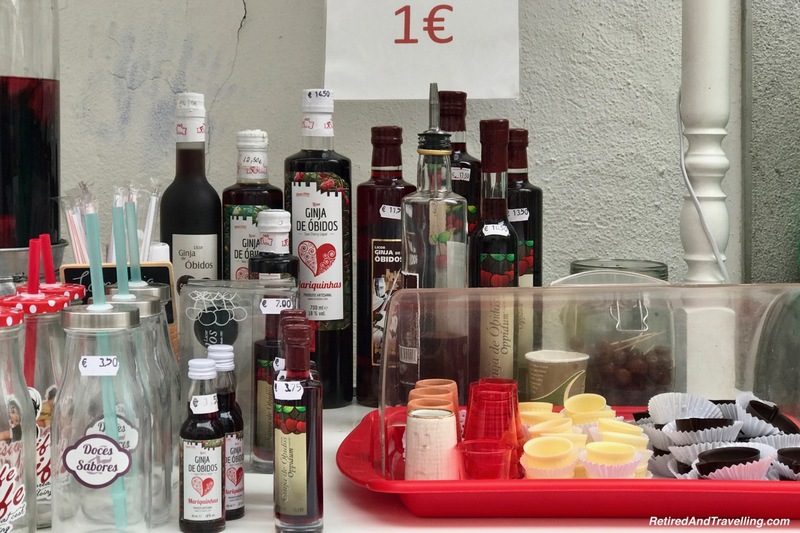 You can get a sample for 1€ on the street. But make sure to try some of the finer brands. And try it without the chocolate cup. It is a much richer taste. 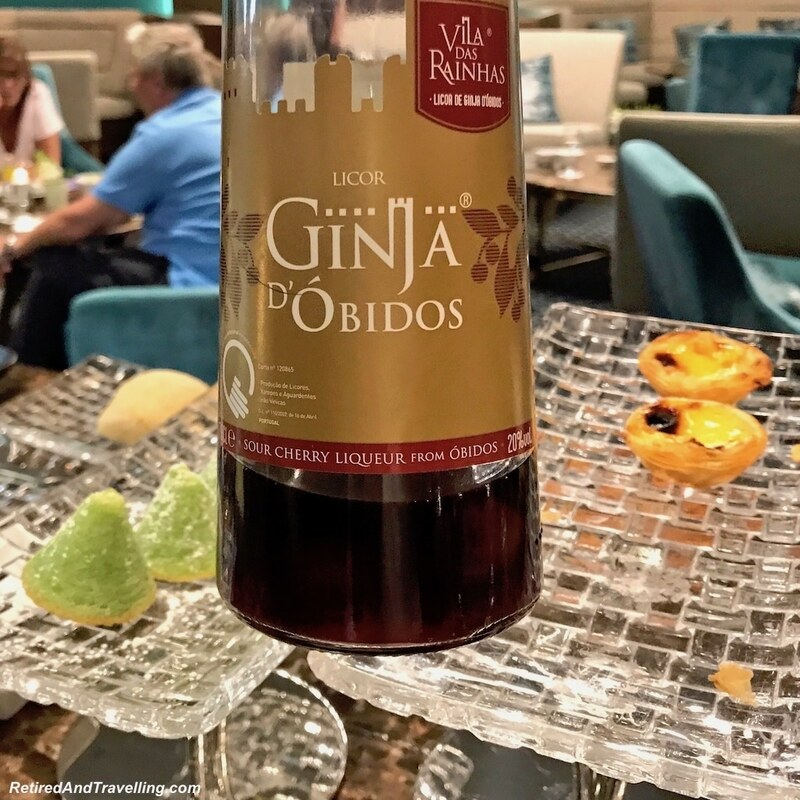 Did you have Ginja in Obidos? Did you like it with a chocolate cup or without?